What lies at the heart of our galaxy? For twenty years, ESO’s Very Large Telescope and the Keck telescopes have observed the centre of the galaxy, looking at the motion of more than a hundred stars and identifying the position of an otherwise invisible object — the supermassive black hole at the centre of our galaxy. Embark on a Journey to the Centre of the Milky Way and during seven minutes travel faster than light, from the driest place on Earth, the Atacama Desert in Chile right to the centre of our own galaxy, where a black hole is consuming anything that strays into its path. 84 million stars will appear in front of your eyes, each hiding mysteries waiting to be solved. Are there planets around them, perhaps with moons? Do they have water? Could they harbour life? 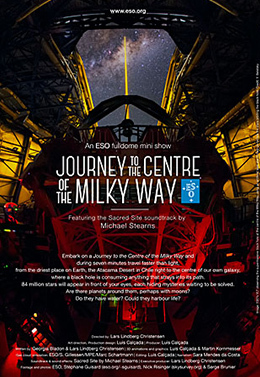 Journey to the Centre of the Milky Way is the first fulldome planetarium mini-show produced in-house by ESO for its Planetarium and Visitor Centre, the ESO Supernova, due to open in 2017. Available for free in 4k resolution, the mini-show can be downloaded on http://www.eso.org/public/videos/eso-jcmw/ and used by any planetarium.